Table saw splitter safety is easy with MicroJig's award-winning splitters. Their patented design makes them simple to install and simple to align. Remove and Remount in 2 seconds and you're ready to go. The MJ Splitter is designed to be an affordable alternative that will dramatically increase your table saw safety. It’s simple to use design makes it easier than ever to achieve optimal safety on the table saw. No more excuses. Get safe. Choose from the basic MJ Splitter or the MJ Splitter SteelPro. Both are simple to align. Just “Plug n’ Play.” Available in 1/8 inch kerf or thin kerf styles. We offer extra inserts for the basic kits. Use with Leecraft Zero-Clearance inserts for optimum use. Not intended for inserts that feature a riving knife slot. 1. Leecraft phenolic Zero Clearance Inserts are totally compatible, and work beautifully, with the MJ splitters. 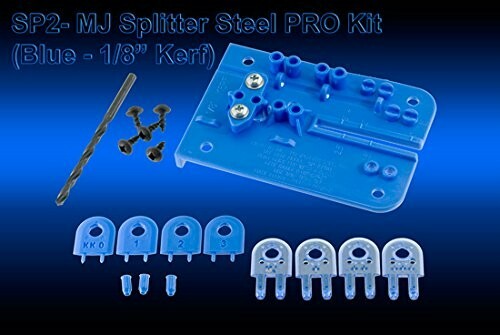 The MJ splitter is a very high tolerance product, and will only work properly if mounted in accurately located and machined mounting holes, which of course the customer must produce himself. Microjig includes an economy-grade drill bit in the kit, which is adequate for softer insert materials like wood and most plastics used for inserts. These bits will quickly dull in phenolic, especially when using a hand held drill. The combination of a dull bit and the inherent inaccuracies of hand drilling, often result in poorly machined mounting holes, which defeat the precision nature of the splitter. To use MJ splitters with Leecraft inserts: You must use an equivalent size HIGH SPEED STEEL (HSS) drill bit and drill press, to precisely and carefully drill the 2 mounting holes, after they are located and "spotted" with the HSS drill bit in a hand drill, using the special drill fixture. Make sure you clear the chips often (peck drill) to prevent heat build up. HSS drill bits are the ones most commonly sold by tool retailers nowadays. Look for "HSS" on the shank. 2. There should be no issues as far as the 2" space requirement, and you can easily confirm this on your particular saw. With your standard factory insert in place, simply raise blade to full elevation and measure the distance from the back end of the blade to the end of the insert. This space will be no different on your ZCI. These are made with a rigid stainless steel frame and then the steel foundation is coated with high density 100% polycarbonate. The result: one tough splitter. 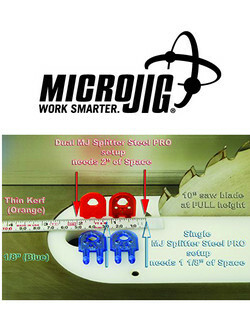 Micro Jig designed the MJ Splitter™ SteelPro to withstand the severe table saw use of a professional woodworking shop. Whether you're working with heavy panels or dense solid wood, the SteelPro will give you the strength to cut them with confidence and, most important, safety.